We all know behind every feminist is a great man. Right? If you're unconvinced then look no further than the case of the two teenage boys in Dazza and Keif Go Viral. 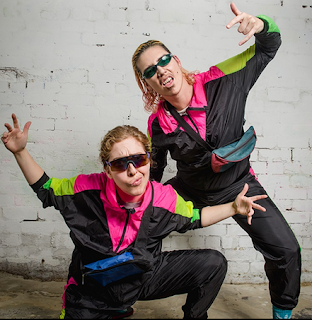 Created and performed by Danni Ray and Keely Windre, the show follows two best mates who are accidentally thrust into the feminist limelight and their response to this new found fame and...responsibility. Dazza and Keif are so realistically portrayed by Windre and Ray that it sometimes becomes a little frightening just how convincing they are. Their physicality, expressions and language are everything you would imagine such teenagers to behave like. Windre is at total ease with Dazza's obnoxiousness and loudness and Ray brings a more sensitive and grounded, but equally frustrating Keif to life. Even with the demanding physical requirements of the show, the energy between the two never wanes. There may be great chemistry in the relationship between the boys but this is grounded in the chemistry between these two talented performers. While the show does raise questions about feminism and gender identity - when the two are impersonating women in one of their videos, it ultimately leads to pillow fighting and making out, but as men, they fight each other and swear a lot - it still feels like it needs to go that bit further to make its point explicitly clear. The conclusion seems to occur quite suddenly and with the interesting way these themes and issues are explored in earlier scenes, it feels like it isn't exactly sure what to do with them at the end. Dazza and Keif may only have one fan on instagram (thanks Dazza's mum), but there were certainly a lot of them at Dazza and Keif Go Viral. There's much to enjoy here and it packs a lot of laughs in to its 40 minutes. With some rework on its story and structure, this can easily evolve into not only a brilliant piece of physical theatre and clowning, but also a show with a very strong message.